Most of these options are self explanatory, so I will only cover a few of them. Display Gas Right of Description. This option moves the Gas to the right of the Description column. 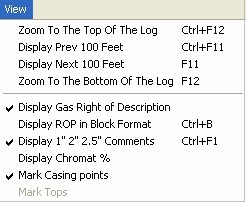 Previous versions of Office Pro displayed the description column on the far right of the log. This will display a small window in the description column that gives a percentage breakdown of the chromatograph. Searches the description column to identify and mark casing points on the log. This method of identifying casing points will allow the program to work with older Suttles logs.